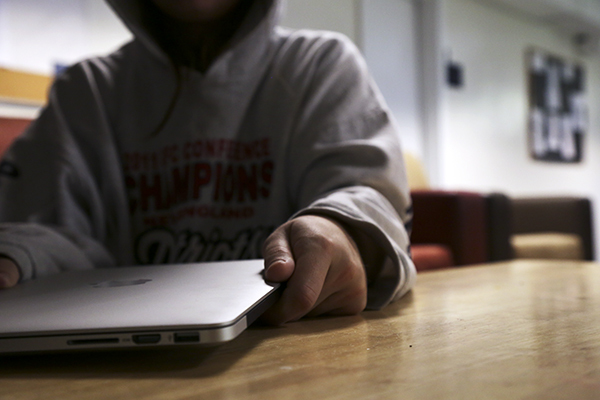 Students have reported laptop thefts from Fulbright, Madison and South halls in the last three weeks. Updated: Oct. 22, 2015 at 1:01 p.m.
At least six laptop thefts have been reported to the University Police Department in three weeks, a trend officials say they will continue to investigate. University spokeswoman Maralee Csellar said in an email that the University does not think the recent thefts are related, but that in their investigation officials will include the Metropolitan Police Department “when appropriate.” One UPD officer said officers are “paying attention” to the incidents. “I have noticed a slight increase,” he said. The officer spoke on condition of anonymity because UPD officers are not allowed to speak to the media. Over the past three weeks, students living in Fulbright, Madison and South halls had their laptops stolen from their rooms, and laptops and other electronics were stolen from a locked but unattended classroom in Smith Hall. There were no signs of forced entry in the Fulbright, Madison and South Hall cases. On Oct. 11, a student living in South Hall reported that someone took his laptop from his room while he was sleeping, UPD Captain Mark Balazik said. Two students in Madison Hall reported their laptops stolen from their room in a two-day period two weeks ago, according to the GW crime log. A student in Fulbright Hall also reported a missing laptop on the same day as one of the Madison incidents. On Oct. 5, a student in Eckles Library said his backpack that had his laptop and an iPad in it was stolen from a chair after he left it unattended. All of these cases are listed as open cases in the GW crime log, meaning officials have not caught a suspect. In his crime report at a local meeting on Wednesday, Metropolitan Police Department officer David Sledge listed several laptop thefts on GW’s campus, and said the spike in burglaries is likely because of students leaving their doors unlocked. He also said one laptop theft had occurred off-campus and told neighbors to keep their valuables hidden to avoid theft. “The majority of our burglaries occur on the University campus,” Sledge said. Two years ago, laptops were stolen from three unlocked rooms in JBKO and Fulbright halls. UPD also arrested a man in Shenkman Hall for trying to steal five laptops and other electronics. After that string of burglaries, officials defended their security presence in residence halls, which was relatively light compared to peer schools. Nika Nourmohammada, a senior, said her color photography class left their items in the class’s Smith Hall classroom – which was locked using a keypad on the door – for about half an hour. When the class returned, she said her classmates slowly began to notice things strewn on the floor and items like laptops, professional cameras and cash missing. “So, he left here with a couple grand,” she said. Csellar encouraged students who have information on the incidents to call UPD or share the information through GW’s anonymous tip line. “We want to remind residents to always lock their doors – even when stepping out to go down the hall to visit a friend and especially before going to sleep,” Csellar said. Last year, the number of burglaries on campus dropped by 70 percent, aligning the numbers with the totals from previous years after a spike two years ago from the string of electronics burglaries. Marissa Kershenbaum and Sam Eppler contributed reporting. While there was no forced entry in the Fulbright, Madison and South Hall cases, there was forced entry in the Smith Hall case.